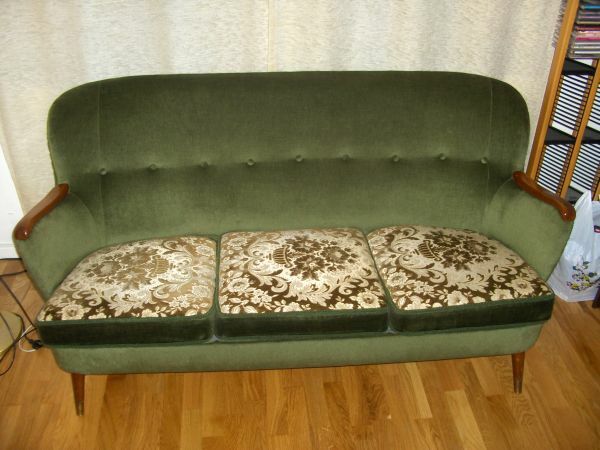 By popular request (OK, 1 request), a more detailed picture of the sofa. We turned the pillows upside down, and then they had a different pattern. I actually preferred the green pillows, but I care only infinitesimally. I am just using it to sit on, if that. So far I’ve been sitting near the fire though. This night I think I fired a bit too hard, for there was a vaguely chemical smell, probably from the paint getting hotter than it has been before. Nothing caught fire though and the smell faded eventually. I was sick all last night (thanks to the soup, no doubt) and slept most of the day, so not much to write about here. Â Working on some philosophical stuff again, but no idea whether I will publish it or just keep it for my own use. Iceberg, remember? Ah! Now I can see it. I think the center cushion might be intended to be turned 90 degrees counter clockwise? Will it fit that way? The two on the ends have the pointy bit pointing inward, so the center might be supposed to point out? I like the green, and I like the pattern, bt I’m still trying to decide if I like them together. I do like the shape of the sofa. High back, high arms that open outward a bit . . .
Yeah, having the three cushions not make a symmetrical design of some sort (or at least along what I think the line of symmetry should be) bothers me a bit. Still like the floor in there.